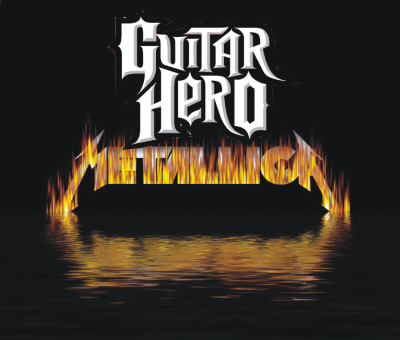 That’s right… Guitar Hero is releasing a Metallica version of it’s popular plastic instrument, rock yer nuts off game. It was only a matter of time… Metallica is simply the most challenging and some of the most fun songs to play on the Guitar Hero/Rock Band games. In an interview that appeared in USA Today, Alan Flore, lead designer for Neversoft, as well as Metallica’s Kirk Hammet and Lars Ulrich talked about the new game. All three agreed that the game will be extremely challenging especially when it comes to the old Metallica songs. This goes across all instruments, with the drums featuring brutal double bass playing (only available by playing on “Expert Plus”). This game will likely be the hardest rocking, most challenging version of Guitar Hero yet.